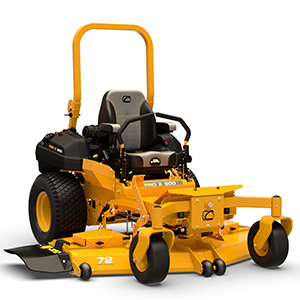 Cub Cadet will launch its newest commercial zero-turn mower lineup, the PRO Z Series, at the 2016 GIE+EXPO in Louisville, Ky., Oct. 20-21. The lineup consists of the PRO Z 100, PRO Z 500, PRO Z 700 and PRO Z 900 Series. The industry’s only Triple 7-gauge deck features three layers of 7-gauge steel, plus ¼-inch leading edge and 5/16-inch side reinforcements. The full length, laser cut steel frame, the 5/16-inch steel rear bumper and the cutting deck are protected with e-coating–a precise, multi-stage process that provides automotive-grade corrosion defense, the company said. High-torque commercial transmissions are paired with high-horsepower, commercial-grade Kawasaki engines to provide optimal and consistent blade tip speed. Productivity-enhancing features optimize rear weight distribution, including pre-drilled mounting points for attachments and smart fuel pod placement. The steering wheel zero-turn option with four-wheel control increases hillside stability and maximizes job efficiency, Cub Cadet said. High-back suspension seats with lumbar support and padded armrests come standard. The PRO Z 700 and 900 Series absorb impact on rough terrain with an industry-leading pivoting front axle dampening system, a vibration isolating foot pan and four seat isolators. The PRO Z 900’s exclusive air-ride seat has customizable seat firmness and additional controls for the perfect fit. Cub Cadet will be at booth 5116 and in the outdoor showcase at GIE+Expo.